These are the results for Eastbourne Magistrates’ Court, sitting at Hastings, for March 5 - March 7. Peter Lonergan, 33, of Hurst Lane, Eastbourne, pleaded guilty to failing to comply with supervision requirements imposed following release from a period in prison. The court made a supervision order with a requirement of a 50 day electronically monitored curfew between 9pm and 7am. Jose Henriques, of Seaside Road, Eastbourne, was fined £220 with £216 prosecution costs for dropping a cigarette on the ground and leaving it at Kings Road, St Leonards, on August 2 last year. The verdict was proved in his absence. Andrew Hind, 53, of Dean Wood Close, Eastbourne, pleaded guilty to assaulting a woman by beating her. The offence took place at Eastbourne on February 4. He pleaded to a further charge of assault on the same date. The court made a community order with a requirement of 80 hours of unpaid work. He was ordered to pay £100 compensation for the second assault. Lee Hunt, 38, of Carew Road, Eastbourne, indicated pleas of guilty to stealing nine pedal cycles. The thefts took place at Goring-by-sea, Worthing, and Lancing, in May and June last year. The bikes ranged in value between £150 and £500. 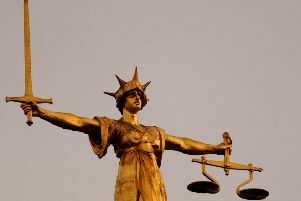 The court made a community order with an alcohol treatment requirement and ordered him to pay £3,350 in compensation. Charlotte L’anson, 21, of Pevensey Bay Road, Eastbourne, pleaded guilty to driving a vehicle on Church Street, Eastbourne, on November 13, with cannabis in her blood stream. She was fined £120 and banned from driving for one year. John McDonagh, 20, of Tudor Court North, Wembley, Brent, indicated a plea of guilty to attempting to steal items. The offence took place at Eastbourne on November 2. He also indicated pleas of guilty to two charges of stealing tools worth £5, 386.17 and tools worth £1,000, at Hastings and St Leonards, on November 7. He was jointly charged with Michael McDonagh, 25, of Medway Parade, Greenford, Ealing, who also, indicated guilty pleas to the offences. Both men were committed to Lewes Crown Court for sentencing on April 4 and released on unconditional bail. Jared Simpkin, 24, of Stanley Court, Brighton, indicated pleas of guilty of being in possession of 520 milligrams of crack cocaine and 791 milligrams of heroin, with intent to supply. The offences took place at Eastbourne on December 14. He was committed to Lewes Crown Court for sentencing on April 4 and released on unconditional bail.